It’s that time of year again ….just three weeks until the annual WASPS Open Studios Weekend. It’s always a good opportunity to promote your work to a wider audience and to make a sale or two if lucky. It’s also very enjoyable meeting the visitors …and a little tiring too. A normal exhibition preview lasts for perhaps two or three hours and that is quite hard work ….we’re going to be open 11 am – 5pm on Saturday and 12 noon – 5pm on the Sunday. By the end of each day my voice is usually fading and croaking! I used to give myself most of the preceding week to prepare for the event but this year I’ll be working away on the last of the 80 x 80 cm paintings right up until Wednesday evening …so it’s going to be a mad rush on Thursday and Friday. To be honest, the Open Weekend is usually the one chance each year to have a complete tidy and sort out of the studios …I think the studio ‘Hoover’ has a bit of a shock each September as everyone seems to be fighting for it! I normally clear all my paints, pastels and other materials and equipment …stashing everything under my bench …everything is then covered with large white pieces of cloth to hide the gear and give the studio at least a slight appearance of tidiness. The walls are in pretty good shape thankfully seeing as the studio was refurbished just over a year ago …but two of them will need a lick of paint …I tend to splash acrylic on the wall behind and to one side of my easel. As anyone who has been following my Face book page will know …the studio is pretty cluttered at present. I’m gradually getting all the work together for the show in Speyer (around 20 pieces) and the show at Queens Gallery in Dundee (around 18 pieces). I also have another six ready for The Strathearn Gallery who are taking them down to Battersea Affordable Art Fair. If I had the desire to do so …I could still, just about, swing the proverbial cat around …but not a big cat! So then before the Open Weekend I have to decide which work is going on the wall and all the rest will have to be taken home …not much room for swinging cats here either …but we should find space. The ‘cats’ in this case, being Anita’s parents who normally visit us for a few days at the start of October …and whom have been asked to give it a miss this year ….everywhere is slowly filling up with paintings, boxes and bubble wrap …absolutely no room for a spare bed this year I’m afraid. Hopefully I haven’t caused too much upset and I’m sure we’ll get to see them later in the year. One job I have just got done is to get some new business post cards printed. I ran out of the last lot a good few months ago but realised I needed some new ones for the Open Weekend. 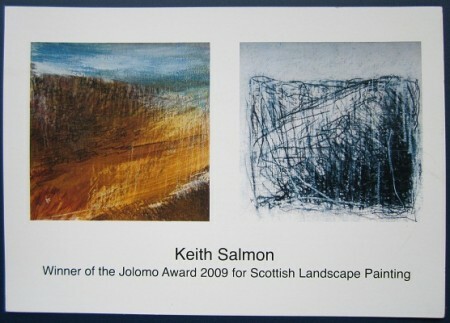 I have a standard post card printed with two images of paintings or drawings …and then the contact details on the reverse. 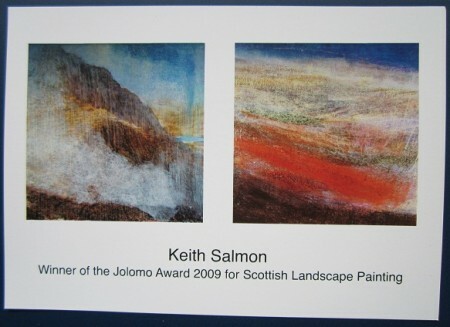 I’ve just had two different designs printed by Kestrel Press in Irvine …and I’m pleased to say that they look good. A great service too …I took the images to them on Monday and a chap arrived at the studio yesterday afternoon with a box containing the 1000 cards …brilliant. They make nice things for people to take away …I know many end up on kitchen walls or fridge doors …but you never quite know who will see them and with my website address etc on them …who knows what will come from someone taking a couple when visiting. It’s a very nice bit of advertising ….that works. Right that’s me again for this week …must get back down to the studio again. For anyone interested, check out the new WASPS website [http://www.waspsstudios.org.uk.d8digital.com]. It should be up and running by later today. If it is, you should find full details of the WASPS Open Studios Weekend …it’s not just the Courtyard in Irvine that takes part …all the WASPS studios throughout Scotland are involved …if you live in Scotland there should be one that you can get to. I’ll post more details nearer the time.but put October 1st and 2nd in your diary …it’s a great opportunity to see a lot of different work.